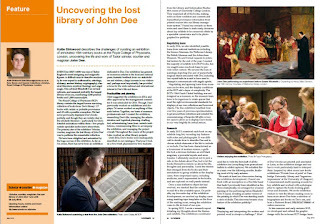 The biggest (though not the only) project on which I’ve been working over the last couple of years has been the creation of the exhibition Scholar, courtier, magician: the lost library of John Dee. It’s the first time the Royal College of Physicians museum has dedicated one of its temporary exhibitions primarily to rare books, and it has been the RCP’s most successful exhibition (in terms of media coverage and visitor numbers) to date. I first suggested the idea of holding an exhibition of John Dee’s books (of which the RCP holds the largest known surviving collection) in January 2013, only a few weeks after I started working there. So this has been a project that has lived with me for a good long while. It’s been a long slog and one of the hardest things I’ve ever worked on. It’s also one of the most rewarding things I’ve done, and one of those about which I feel most proud. Credit is due in huge part to the museum team at the RCP who did all of hard work. I wrote an article for the May 2016 issue of CILIP Update magazine about the process of putting the exhibition together. After a month’s embargo, I’m now able to share it directly online. I’m continuing to reflect on the process, and will continue to do so for quite a long time, I suspect. I’ve written up a different version my thoughts here, in case it’s useful. John Dee had such a varied and complicated life that it’s hard to know where to start writing about him or describing what he did. He’s a well-known figure but doesn’t have any famous things named after him, or one book to his name that everyone’s heard of. The books are pretty difficult to interpret: they’re mostly written and annotated in Latin, many of the subjects are complicated to explain, most of the authors are not very well known. And taken as a whole, Dee’s age had a very different world view to ours. It’s hard to explain all of this satisfactorily in short captions. We were expecting a wide audience for the exhibition: from rare books and bibliographical experts, people who’ve read widely on Dee, those generally interested in Tudor history, to people who’d never heard of Dee or never looked at an old book before. That made it hard to know where to pitch the text: it takes a lot of crafting to create descriptions that explain technical details without being baffling to the non-expert or obvious or simplistic to those with specialist knowledge. A lot of the ‘facts’ about Dee’s life and books are, in fact, not 100% certain. Hedging around issues makes for less compelling reading and add lots of words to text. But you can’t portray as certain truth something for which you know there isn’t hard evidence. Cue further tinkering with the text, adding and removing lots of ‘may have been’s, ‘is believed to have’s, ‘has been suggested that’s and so on. I found Dee as a subject completely overwhelming. It took a really long time to get a sense of just what the exhibition would really be about. At some points it felt like progress slowed to barely a crawl: collaborating with other teams required a lot of sending ideas and files back and forth to get every concept and every detail correct. I really wasn’t looking forward to day when we tried out the actual layout of each of the display cases with the books themselves: I feared that it would show that all of my ideas were unworkable and that we’d have to go back to the drawing board. However, it was actually really good fun, and incredibly exciting to see the exhibition start to take shape in front of our eyes. I made a few gifs of some of the exhibits, which proved to be more wildly successful that I could have possibly imagined. I thought they were maybe a bit naff. Or at least a bit niche. But #earlymodern Twitter and beyond really took to them. Bonus: making them was really fun. We devised an audience engagement/participation activity by the name of #DoodleDee: here’s a blank postcard, why not leave us an exhibition-inspired doodle (for the chance of a monthly prize)? I had no idea people would take it up so keenly, and imaginatively. There have been some really charming (and bizarre) doodle submitted. Opening day was amazing. It’s very very rare that, after doing something, I genuinely feel pleased with it and can sit back and bask in the warm glow of pride and satisfaction. This was one of those occasions. There are, of course, things I would change if I could, or wish I had done differently, but nothing so much that I’m unable to appreciate that what was achieved is good. I really, really, don’t like uncertainty in the early stages of a project like this. For some people, the myriad possibilities and options are exciting and stimulating. For me, they threaten to be completely stymieing. I have to impose some order – for example, making arbitrary decisions about content and arrangement – in order to make progress. While I have an eye for (some) details, and a clear idea of what ‘right’ will look like, I don’t enjoy having to request corrections from other people, especially if it takes more than one attempt to get corrections implemented. I went through agonies when we were proof-reading the design work. I need to learn a way to say ‘[this bit] needs to look like [this thing]; it currently doesn’t have [something or other]’ without worrying that I’m being a malicious control freak. Even though I started out not knowing... my priorities – both large and small scale – did emerge. It was surprising to see what I did, and didn’t, consider vital: the orientation of an image on the wallpaper mattered a great deal, but I really didn’t mind changing the placement of the display cases on the gallery even at the last minute. I didn’t really know what the exhibition was about, or what the overall story was until I started given tours to journalists the week before we opened. I would have done well to start imagining the tours well before that. Start early. No, earlier than that. Synthesising information takes time; the sooner you’re on top of the facts and figures, the sooner (and more easily) you can get down to the creative side. Take notes. Take more notes. Tiny details will suddenly take on huge important as deadlines approach. Future-you will love past-you if you’ve written down as much as possible. Don’t trust your memory! Know your strengths and weaknesses. What are your usual failure points? Let your team know, and what they can do to mitigate! Guess. Sometimes there just isn’t a right answer, or, at the very least, not one you can work out right now. So guess: pick an option and try it out. If it’s not working you’ll know soon enough and can change. If it is working then you’re sorted. Know your priorities. If some things need to change and you’re not too concerned, then let them go gracefully. There will be some things you’ll really want to stand and fight for, and you’ll know it when it happens; save you energy for those. Build in flexibility from the start. If you pick one option from two-or-more equally as good (or more-or-less as good) options, keep a note of those you didn’t choose, in case the first idea doesn’t pan out. Don't forget your passion. It can be easy to overlook the things, objects or ideas that made you go ‘wow’ right at the start. Keep them in mind: they’re the best selling point. Trust your exhibits. Let them tell their story. Work out what the key feature of each item is, and make sure that’s what you communicate to your visitors. Know exactly why each item has been included. Promote early, promote often (and use the professionals). The huge coverage for ‘Scholar, courtier, magician’ was the product of three things: Dee’s cult status, giving plenty of notice (a year plus) about the exhibition, and hiring a professional publicist.